The word ‘milliner’ is related to ‘Milan’ and particularly milener – a Middle English word used to identify an inhabitant of Milan. Craftspeople from this city used to travel around Europe, delivering hand-made flowers, feathers, Florentine hand-woven straws to noblewomen. This is one of the many things I learnt when I met milliner Lina Stein at her studio near Westport. Given my Northern Italian roots, I was obviously very pleased to find this out, but it was the creativity, skill, awareness and personality that go into hat-making that blew me away during the 2 hours spent with Lina. “Millinery is a very physical business”, Lina explains while steaming and pressuring a brim on a wooden block. Wooden blocks are essential to hat-making, as they provide the hat shape. Lina uses blocks that are individually carved: “I pick them up at flea markets, auctions and I got some of them made specifically for me”. Lina’s studio is surrounded by mirrors, which give her both perspective and a critical eye: “The tridimensional element has always been very important to me. Part of my training was in theatre, so I look at what I see in the mirror because this is how the hat will actually look like”. Lina learnt her craft in Australia, where she is originally from. She started her business in the early 1990s: “I started in Dublin, but then moved more and more West”. Lina used to run her own shops, supplying both clients and other shops with “mostly wedding and racing hats”. But after the birth of her second child, she decided to take a break. However, she became eventually interested in teaching: “I thought the time was right to share my skills”, she says. In the last 10 years, Lina has thought in 3 different continents and has organised a number of summer and winter schools inviting high-spec milliners from around the world to share their skills with Irish milliners: “Millinery is a lonely business, but during these workshops people can have fun and meet other people”. I was amazed to see how literally anything – flowers, old hats, even lightbulbs – can be assembled into small architectural structures, which are skilfully designed, rigorously built and kindly customised to meet the needs of each customer. Lina works with traditional materials such as straw and felt, but is very keen on experimenting with new ones: “I work with absolutely everything”, Lina tells me, “as long as something is a bit pliable and movable and you can play with it, it’s all about experimentation and being adventurous”. And it is not just hat-making that is playful and adventurous. Wearing a hat “is like make-up” – it changes one’s outfit and changes one’s mood. This came across quite strongly during my visit. “Life is too serious and wearing a hat helps you smile”, Lina explains, “Hats don’t simply complete your outfit. 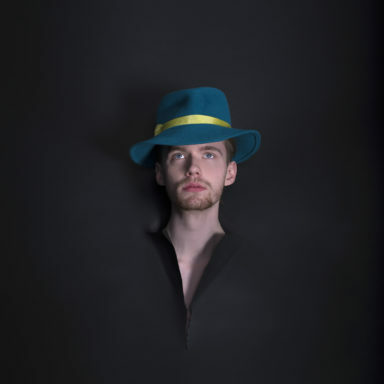 Hats do not have to match what you are wearing. Your hat should be the pièce de résistance, it’s not necessarily the dress”. Very often people do not think about hats in this way and many do not understand the vision and the amount of work needed to craft the ‘perfect’ hat: “The West of Ireland is mostly rural, Galway is nearby but it can be difficult to find the right customers, shops or individuals. It’s easier in cities such as Paris and London”. Also, accessing materials and basic business services such as in-site photography can be challenging. As a creative entrepreneur, it is therefore important to create a network of supports including trusting clients and students who want to keep in touch. Nurturing the brand is also very important to Lina: “Winning prizes at events such as the Galway Races is good because it helps you build your reputation”. Needless to say that, if I ever make it to the Races, I will ask Lina to design and build my hat; perhaps through the origami technique, which she has been exporting to Australia and the US. The Galway Races are on at the moment and if you are, or are going to be there this year, enjoy the experience, don’t worry about anything and wear a smile. Wear a hat. Perhaps Lina’s hat.